Bernard "Midget" Farrelly "2007 Surf Champion"
It’s no secret that surf stars Down Under receive similar accolades to baseball stars in the States. Some, of course, deal with the fame in different ways than others. Midget Farrelly simply surfed hard, won titles and wasn’t too concerned with all the hoopla that accompanies stardom. He returned to his hometown Sydney, Australia a celebrity after winning the 1962 Makaha International at age 17, then regarded as the unofficial world championship. His disdain for the spotlight surfaced early as he was heard saying, “I just got sick of the whole thing halfway through and couldn’t surf seriously.” Despite winning, he dyed his bleach-blonde hair black in an attempt at anonymity. PHOTO: North Shore with 2007 Walk of Fame Surfing Champion inductee Midget Farrelly and Drew Kampion. PHOTO: Midget showing the classic drop knee style that won him the title of World Champion in 1964 in Sydney at Manly Beach, inspiring many Aussie world champs to follow. Soon after this first big win, Farrelly was catapulted to hero status as magazines such as Surfabout and Surfing World put him on a pedestal to the Australian public. Midget was victorious at the Australian National Titles in 1964, going on to win the inaugural World Championships held in Sydney. After his victory, Farrelly still remarked, “I just felt sick of it all,” -- a surprise to many that watched him surf. 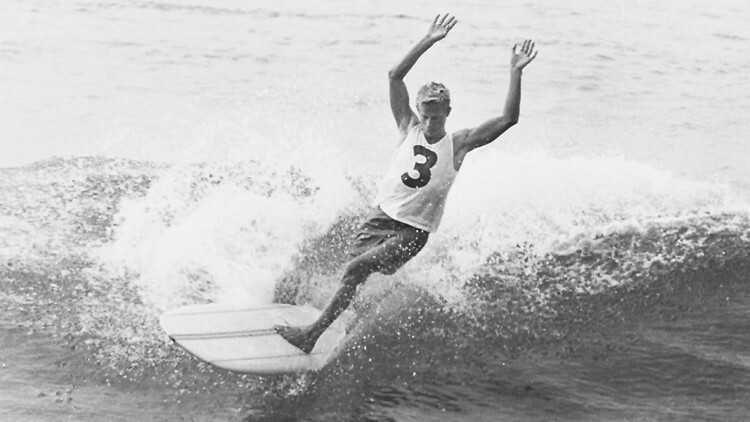 From 1962 to 1970, Farrelly was considered by most to be the best competitive surfer in the world. He also defeated a young upstart named Nat Young in both the 1968 and 1970 World Championships. Originally friends, Young and Farrelly soon became fierce competitive rivals. However, the exact origin of their hatred remains unclear. He contributed significantly to the late-60’s surfboard design movement, founding his own label, Farrelly Surfboards, in 1965. His quest for progression brought the Midget Farrelly Stringerless model to U.S. shores thanks to Gordon and Smith Surfboards. Farrelly appeared in countless surf magazines and films and even landed his own ABC show in Australia, aptly named The Midget Farrelly Surf Show. 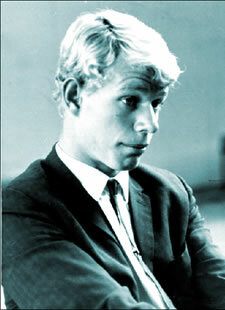 He published his second book in 1968 entitled How to Surf. Farrelly was born in 1944 in Sydney, Australia and began surfing at age six on a 17-foot hollow paddleboard, which, when standing next to it, was what earned him the nickname “Midget.” Midget was married with three children living in Australia. He passed away in August of 2016.